Emperor Qin’s father was Ying Yiren. In his youth, Ying was a prince of the Qin State living in exile as a hostage, held by the State of Zhao. Life as a hostage was difficult, and Ying lived in extreme poverty. Ying’s grandfather was the King of Qin, but Ying’s father was not the crown prince. Ying also had more than 20 brothers from his father’s many wives. He was sent to Zhao because he was a member of the royal family which was common practice in the Warring States Period to keep peace between neighboring states. At that time, there were seven states in China, all at war with each other. Zhao was one of the strongest militarily, and had been at war with Qin on and off for decades. In 260 B.C., merchant Lu Buwei visited Ying, who was living in deep desperation. Lu, with an uncanny political keenness, realized that this was his once-in-a-lifetime opportunity. Lu invested a large amount of money to support Ying, and even gave Ying one of his favourite concubines, Lady Zhao. The following year, 259 B.C., Ying and Lady Zhao had a son. They named him Ying Zheng, who later became Emperor Qin Shi Huang. Lu continued to politic on behalf of Ying Yiren. Thanks to his artful persuasion and generous bribes, Ying and his family were able to return to the State of Qin two years later. 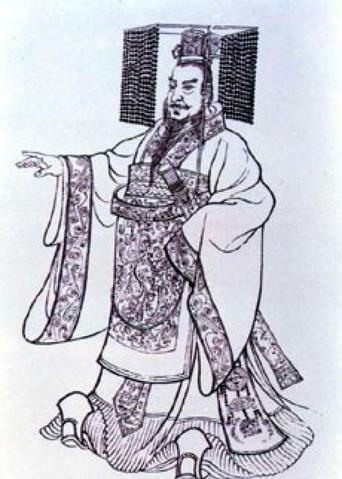 Lu also managed to make Ying’s father, and subsequently Ying, the crown prince. At age 12, Ying Zheng became the king of Qin in 247 B.C. after his father died. (Some conjecture exists amongst scholars who claim that Lu Buwei was actually Ying Zheng's father.). Lu became the highest official in the court and handled all state affairs. Lu's good luck did not last long however, and in 238 B.C., Ying Zheng became an adult and took over the power of the country. Soon after, Lu was involved in a coup and was forced to commit suicide. All that was left of him was the history books he edited, which are still well known today. After Ying Zheng became king, he was determined to strengthen Qin, and was preparing to take over the other six states. Qin's policies focused on the rule of law. He rewarded farmers and soldiers for building up the country's economy and military might. Gradually, Qin's laws became very detailed and comprehensive. For example, families were fined for violating the draft if they had sons but did not send them to join the army. Ying Zheng's approach to the warring states was to befriend far-away states and attack the ones nearby. In a little over a decade, the states near Qin were defeated and annexed. Soon after, Qin was able to take over all six other states, in addition to the state of Nanyue to the south (which includes today's Guangdong, Guangxi, and Yunnan provinces). By 221 B.C., he had formed a larger dynasty than ever before in Chinese history. How should Ying Zheng rule a country of unprecedented size with a larger population than ever? Many officials suggested that he divide up the land and give it to generals as rewards, essentially creating smaller kingdoms, but Ying Zheng disagreed. He was the first to proclaim himself as emperor of China. There was no such title before he created it and was therefore called the First Emperor of China. He hoped that Qin would last forever so he implemented policies that strengthened his own power.